We awoke in a field. A solitary motorcycle and sidecar ambled by in the early dust of sunrise over the steppe. It was going to be a haul to cross the country in a day, but we were determined to give it a go. Thankfully the border guards had told us about the transit lane in another corner of Moldova through which we had to pass. By the time we got there the line of cars waiting to enter Ukraine stretched along for at least a couple of kilometers. Odessa popped up in front of us and we paused for petrol and more cash - credit cards appear to be a thing of the past now. Odessa has some quaint streets and a park we circumnavigated twice, but it was a day for covering ground. 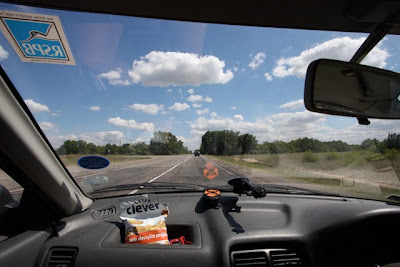 Between the two of us and with the aid of a compass we’ve negotiated most of the big cities pretty successfully and in no time we were once again avoiding potholes as we ate up the miles towards Mariupol. Our vague plan was to stop for dinner there. Positioned as it is on the Black Sea’s topmost inlet, we reasoned Mariupol must be a good place for seafood. The west end of town was all modern shopping centers, the middle full of aging postwar buildings, and the east end simply and completely shocked us. Like a huge fist in our faces we were sucker punched by the ugliest steel works Tom or I had ever seen. Easily covering ten square miles, the site sprawled with massive blast furnaces, rail yards, and power plants, their smoke stacks crazing the sky. Looking over our left shoulders we saw industrial waste production facilities lining the valley to the north. We agreed simultaneously that there was no way we’d eat seafood anywhere near the town and the prospect of beef from three legged mutant cattle, or vegetables in heavy metal, was equally unappealing. We pressed on towards the border, finally stopping for dinner about 20 kilometers from Russia. Ordering dinner involved a great deal of hand waving and coaching from Oksana, Lillian and Mary, three co-workers, all moms, on a weekend’s brandy drinking escapade. Tom and I tried to be charming, despite an almost complete language barrier. After a couple of beers and sharing our life stories we bid our farewells, finally making camp in the fourth field we found. We’re getting picky about our fields.